After the success of my earlier post on the Biggest And Most Expensive Stocks In Singapore (from the pageviews perspective), I deduced that my blog readers are interested to see such Top Lists. Talking about the most expensive stock, do you know which is the most expensive one in the world and how much per share? I believed most of the Value Investors know this. It is non other than Warren Buffett's Berkshire Hathaway (BRK). The closing share price as of yesterday is USD207,321 per share. Yes, there is no typo and it is really more than USD200K per share! For your information, the stock crossed the USD100K just 8 years ago (in 2006). Amazing right? 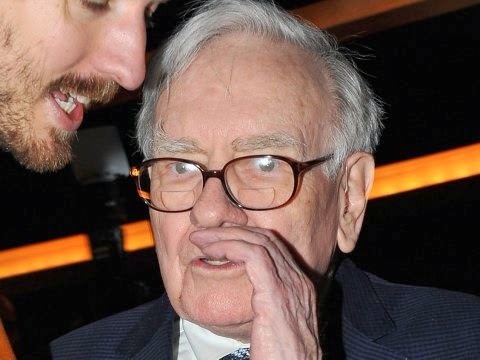 Of course, not many of us can afford to invest in Berkshire Hathaway (even for 1 share), unless you are talking about their B share (Berkshire Hathaway B) which is last traded at USD138.33 per share. Do we equate high stock price or affordable stock price as expensive stock? Value for money? When it was $100K, very expensive. Right? At a 9% return annualised over the last 8 years, it is not at all expensive. Go with the lower cost B shares, well within reach. I wanted to buy the stock once and mistaken the comma for the fullstops. Fortunately I did not press the confirm button, otherwise will have not enough to pay. The Unfortunate thing is I never buy it. David : no worry, there is/are always other opportunities!